Phew! I like having this extra day to play catch up. The past few weeks have been a whirlwind. We've had friends visit for Superbowl and Valentine's day weekend. We got out to the Rhumbar and had a rather lackluster dinner at N9NE. Jeff's dad kicked off the steady stream of visitors that are coming in to meet Alexis. Frank's mom has been here a week already, and more will follow. I think Amy & Jeff are adjusting to a family of five well. Nick doesn't seem too annoyed with his little sisters and Addy is an adorable big sister. When the baby cries, she will "Shhsh" her in the cutest way. 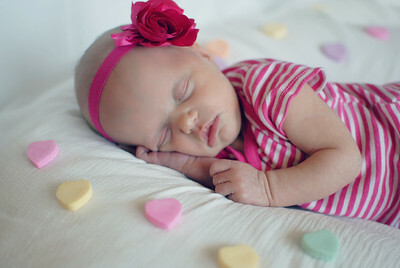 I didn't know what to expect living with a newborn, but Lexi is a really good baby. She's content much of the time, she sleeps and eats well. 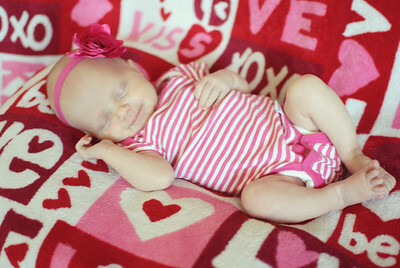 It's hard to believe she's a month old already. Spring has sprung here in the desert. We've had really beautiful weather the past couple weeks. It was motivation to get the backyard into shape so we can maximize our enjoyment of outdoor living. Frank spent a couple weeks getting bids for various projects, and we ultimately settled on adding solar panels to heat the pool, raising the wall to our only neighbor to 6ft, adding a paver patio with built-in gas fire pit, and ramp to the side of the house to store our monster sized garbage cans. The solar panels only took a day to install, and the landscaping contractor knocked out the rest in three days. Though, the fire pit isn't complete, the stone veneer we chose was on back order, but it'll be quick to finish it up. I'll be sharing before & afters. I still need to purchase patio furniture, but I cannot wait to see it come together. Amid the chaos, I've been sick the last week and a half. I've had an upper respiratory infection which wouldn't have been so bad if it weren't for the nasty cough. It's left me sore and without much of a voice. Thankfully, I'm finally feeling a bit better. Not a moment too soon, either. Our trip to Nicaragua is already here. I look forward to sharing our adventures with you. My name is Kellee and I am a fusion addict. The latest craze seems to be sushirritos. Understandable, right? I mean, what's not to love when Mexican and Japanese worlds collide? Thankfully, Soho SushiBurrito has delivered this delight to the people of Las Vegas. Located near David's Bridal across from Palace Station on Sahara Avenue, you might expect this place to be a hidden gem, but word is definitely out. There is always a line. Fortunately, the ordering process similar to Chipotle is an easy concept and the crew plows through orders quickly. The space is small so you're in tight quarters and if you find a seat consider yourself lucky. Timing is everything. Soho SushiBurrito is a sister restaurant to the famed Soho Japanese Restaurant. Chef John Chien Lee mastered his skills all over the Vegas strip, mostly notably at Social House before going out on his own. He has proven to be successful and I feel it's only the beginning. There is definite demand for this style of fast casual food. The menu offers salads, bowls, nachos and burritos. You can choose from proven combinations or create your own. Therefore, it's possible to accommodate most dietary needs. 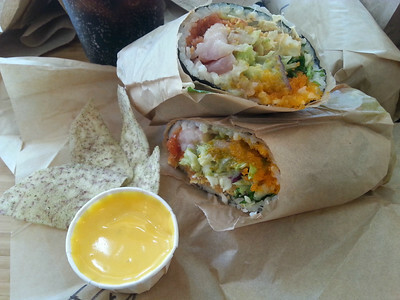 I have a major weakness for yellowtail, so it was easy to narrow down my choice to the High Maintenance Burrito with Nori wrap ($8.50). This is loaded with yellowtail, spicy tuna, masago, guacamole, cabbage and cilantro sauce. My brother hasn't dabbled with sushi so he opted for the less adventurous Sante Fe Burrito with the Soy wrap ($6.25). That one has chicken breast, onion, corn, jalapeno and cheddar cheese sauce with mango soy. We made both a combo to include drink and a side. Don't be shy definitely go with the Taro Chips and Cheese! The chips are mighty delicious with furikake seasoning. All in all, this lunch hit the spot. It's perfect when you're craving something out of the ordinary.